Cover: Rudy Nappi, yellow and red yet again With some blue on Joe. The usual trope: the boys looking on in amazement at something dangerous and/or sinister. Cool depiction of the human spider. Their bikes look dated however. Setting: Back in Bayport, that hotbed of criminal mischief. Where’s Fenton This Time? : New York City investigating a weapons smuggling case. Don’t worry, he shows up at the end. Which Chums Show Up? : Chet, Tony, Biff, Jerry, Iola, Callie. Chet gets the big action, as usual. What’s Chet’s Hobby This Time? : Wilderness survival, aka vegetarianism. Yup, rock, meet hard place. Aunt Gertrude’s Dessert: Ah, a chocolate fudge cake that she has Chet deliver to a neighbor since he is on a diet and thus won’t touch it. A hilarious scene results that is very well written. Hint: never entrust a cake to Chet Morton. Plot: A gang is stealing cars near Bayport, and how they do it is the key part of the plot since this is a particularly clever gang. Lots of folks involved and moving parts. Oh yeah, and foreign weapons. 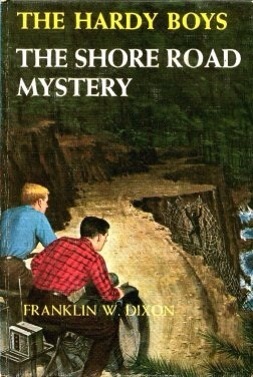 Oh, and a long-lost treasure (the Hardy Boys find so much treasure in their career, they should be billionaires by now). Review: I like this one a lot. All the pieces are in place with the chums, Chet’s hobby, Aunt Gertrude, Fenton off somewhere but performing the cavalry role in the end, Bayport continuing its amazing streak of criminal behavior, clever crooks, this one has it all.